I finished the wing, but I’m not sure I like it. The outer edge looks funny. I would rather not redo it, but I’m considering it. First I’d need to figure out how to do it differently. There’s no point in redoing it if it looks just as funny the second time. I am working on the head too – lots of colorful little spots! That’s really good advice. I hadn’t thought of that. Thank you. The point about waiting until the wing is connected to the head is a good one. Isolated sections often look a bit odd, and then settle back once they are part of the whole piece. Hi Hannah, haven’t stopped by in ages (remove that frown, it’s not because I don’t love you) as I have been taking a break from the internet. I see you have been up to lots of lovely things. The advice re waiting until the leaf is finished is sound. 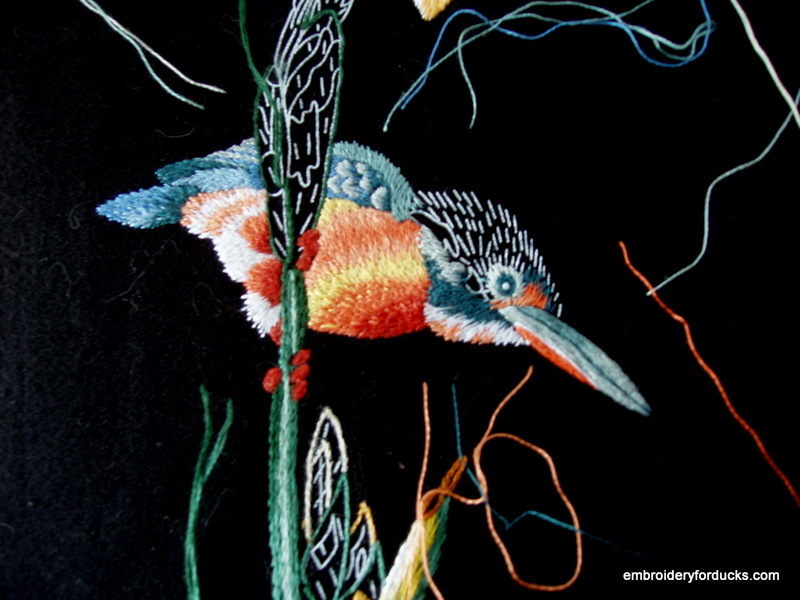 If you don’t like the wing after that I would recommend that you photocopy an outline drawing of the design and experiment by drawing in stitches of various kinds and directions. Even after 20 + years of experience there are times when the solution to a problem is not obvious to me and I will do this exercise. Doesn’t take long and can really help.